A consummate professional and a multi-award winning agent who unites great empathy and people skills with an outstanding ability to negotiate, Brett Schembri is genuinely passionate about Macleod and the surrounding area. A familiar face within the suburb, Brett’s strong ties with Banyule are the result of having grown up in the district. Currently living in the local area, he worked in the family’s Macleod Butcher shop for almost a decade. Brett believe's that this local knowledge gives him a distinct advantage when it comes to matching the right buyers with your home. With knowledge of the characteristic of each suburb and streets that few other agents can attest to, Brett can guide buyers with confidence; answering questions on schools, parks, the station, bus routes and even where the best pizza can be found. This combined, with a thorough and intimate understanding of the local property market, ensures he can both be relied upon to give his clients astute advice about their home. Brett can then devise highly effective, innovative and above all, cost effective marketing campaigns, through a variety of mediums. On numerous occasions, through use of his extensive database, Brett has sold homes before they reached the wider market. Working within the Ray White group, recognized for having sold more residential properties in Australasia than any other real estate group, allows Brett to utilise the extensive network of agents and agencies that allow for a greater reach of their clients' properties. Brett has achieved “Alan White Elite Status” placing him in the top 2% of sales agents in the Ray White group. Through diligence, hard work and perseverance he has also earned the title as the Number 8 Performer for the Ray White Group Vic/Tas. 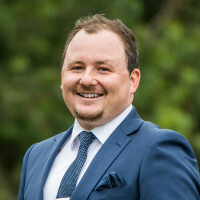 Warm, personable and friendly, Brett brings enormous commitment to each sale, believing that communication, transparency and enthusiasm are the key elements of all successful property transactions. Working as a team with Ashleigh Lawson, Director of Ray White Macleod and Assitant Stephanie Ives, keeps a consistency at open for inspections and during negotiations, and ensures constant, consistent feedback to their clients ensuring they are informed throughout the entire selling process. Whether clients are selling or buying, their united approach, attention to detail, organisational skills, energy and efficiency ensures a real estate experience that is easy and as stress free as possible.